What is a Snare Riser? How Do We Use Snare Risers? A snare riser is a progression of snare drums triggered before a drop or transition in a dance music track. They help build suspense, tension, and excitement just beforehand and can really drive home an idea or main point in a song. The in the remix below, Waio uses one before a particularly filthy drop at about 3:40, and then again at around 4:30. This tutorial will show you how to make a snare riser in FL Studio. We want both snares to sound similar and have a quick attack and release time. Attack is how long the snare sample will take to reach it’s max volume, and release is how long the sample will take to go back to zero volume. Another way of looking at this is to look for samples that don’t last long in the Mixer. What’s that mean? Let’s take a look at the three snares below that I’ve routed to the Mixer. We can see the two on the right have quick and snappy rises and falls. The one on the left is no bueno for our purposes. The release time is too high. We also want samples that are completely dry, meaning they have no other effects applied to them such as delay or reverb. We’ll be adding our own effects in the Mixer later on. I ended up choosing the two shown above called Attack Snare 59 and Attack snare 44. These are located in the ModeAudio folder in the Browser/Plugin picker. Route each snare from the Channel Rack to it’s own Mixer track. Then, route both snare tracks to a separate single Snares track. Unplug each of the two snare tracks from the Master track. Now, both snares are being sent from the Channel rack to their individual tracks, and then meeting up in a third track before being sent to the Master track. Add a Fruity Balance to each of the two individual snare mixer tracks. Pan one snare hard right and one hard left and create automation clips for both of these knobs. This creates a massive widening effect when you use similar sounding samples. I do this all the time when I mix my drums. We’ll be using a low-pass filter on the single combined snare Mixer track to create a sweeping effect. 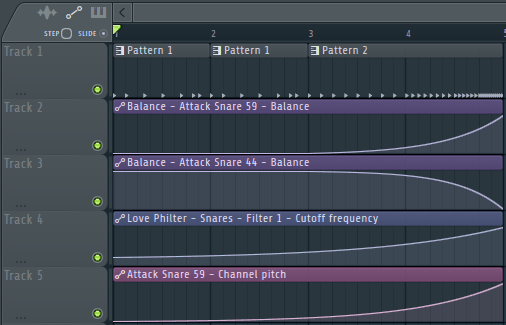 Add a Fruity Love Philter to the single Snares track where both are being routed. Leave the filter type as SVF (state variable) and LOW all the way up. These are default settings. Change the filter from SINGLE to TRIPLE and create an automation clip for the filter cutoff CUT knob. Turn the resonance RES up to 75%. 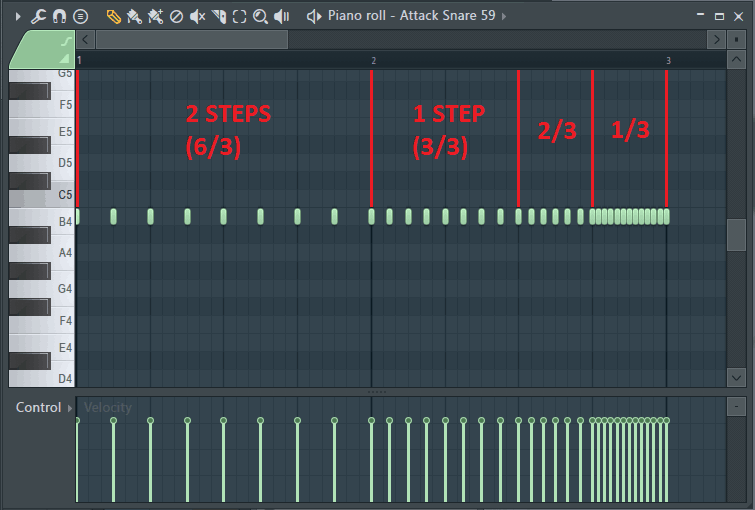 Next, navigate to Pattern 2, change the main snap to 1/3 step, and open the Piano roll for Attack Snare 59 to begin adding notes for the Pattern 2 sequence. You can do this by clicking the three yellow buttons at the top right of the Step Sequencer, and then clicking the blank gray space that appears in the Attack Snare 59 channel. Program the Piano roll for Pattern 2 as shown below. Start off with a snare every two steps (six thirds), then increase to every step (three thirds). The last two sections will have a snare every two thirds of a step and every third of a step. Next we’ll add some variation to the volume of each individual snare hit, also known as the velocity. This gives it a more realistic and humanized sound. To do this, you’ll need to navigate to the Attack Snare 59 Piano roll and hit ALT-R. This brings up the Piano roll randomizer window. We only want to randomize the velocity levels, so uncheck Pattern and turn the blue VEL knob up to about 8%. Click Accept. For more details, check out the separate tutorial on velocity randomization. The last step here is to hit CTRL+A to select all, then hit CTRL+C to copy the pattern. Navigate to the Attack Snare 44 Piano roll and hit CTRL+V to paste the sequence for the other snare. Make sure both snares on Patterns 1 and 2 have the snares being triggered on the same note. Navigate to the Channel Rack and turn the main swing up to about 16%. This will further humanize the sound of the snare riser. Click Attack Snare 59 in the Channel Rack. Change the pitch range to 12 semitones and right-click the pitch knob to create an automation clip. Do the same for Attack Snare 44, except instead of creating a separate pitch automation clip, link it to the other snare’s pitch automation clip. Right-click the pitch knob and click Link to controller. In the Internal controllers list, select the automation clip for the first snare channel’s pitch to make the link. Click Accept. Navigate over to the Playlist. Paste two Pattern 1 copies and one Pattern 2 right after those. Extend the four automation clips to the same length as the snare patterns. For the Fruity Balance panning automation clips we want them to start at hard left and hard right and then switch positions as the snares get played faster. For the Fruity Love Philter cutoff frequency, we want it to start low at about 20% and then gradually open up to 100% to create a nice sweeping effect. We want the channel pitch to remain at 0% (-12 semitones) and gradually go to 100% (+12 semitones) to create even more tension before the drop or breakdown. Like I said earlier, we use snare risers to build additional tension just before a drop, breakdown, or transition in a track. If you like the way it sounds, you can bounce it to a .wav file and add it to your samples to use in a track. Keep in mind though, that whatever tempo you bounce at, you want to match with whatever tempo your song is. This tutorial was done at 130 BPM. And always remember none of these settings are set in stone. Do what sounds right to you. If you want more or less swing, go for it. If you don’t like the intervals in the Piano roll, switch it up. There is so much more you can do with this to make it your own. That’s it for today. If you liked this 100% free FL Studio tutorial, let me know what else you’d like me to cover in the comments, on the Synaptic Sound Facebook page, or YouTube channel!